This Fall 2013 semester the SUST program is offering SUST 220 Water, one of the core 200-level courses in the Sustainability Studies curriculum, in a special hybrid format at the Chicago Campus. Taught by Mike Bryson, Associate Professor and SUST Program Director, the course will meet online starting Friday, Sept. 6th, as well as face-to-face on four subsequent Fridays throughout the Fall semester (Sept. 20th, Oct. 11th, Nov. 1st, and Dec. 6th). Weekend Sessions: Lectures + Discussions + Field Trips! 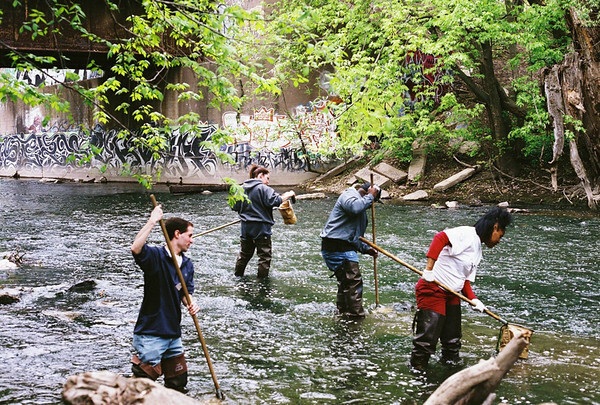 Fri. 9/6 — Meet at the Chicago Campus (Gage 218) for course orientation and initial explorations of local water resources. Our semester will start with an introductory lecture on water and sustainability, personal introductions amongst ourselves, and a discussion of water as a resource and a cultural motif. Bring your own lunch, wear good walking shoes, and dress for the weather! We’ll head outside to explore the campus as well as selected nearby sites in downtown Chicago that are instructive for thinking about how how water moves through and impacts the local community. 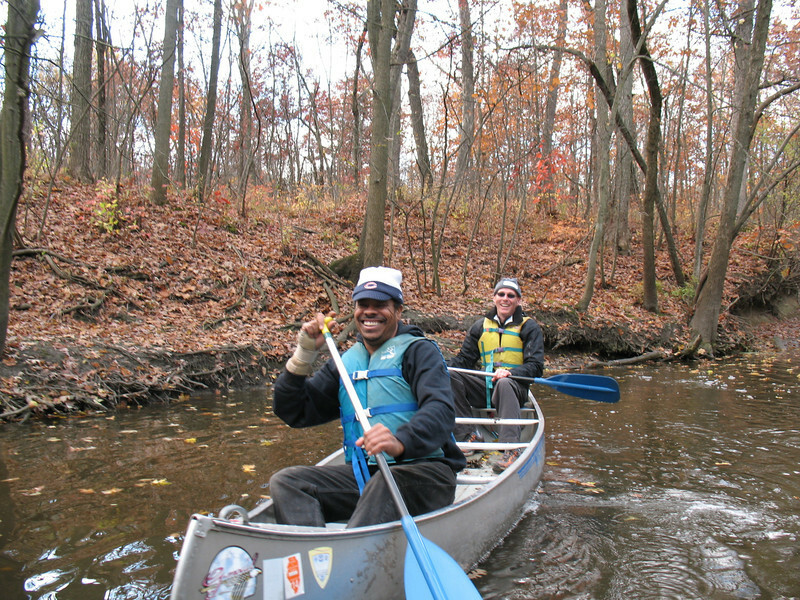 Fri. 9/20 — Canoe Trip on the North Branch of the Chicago River. How’s this for a cool Week 3 of class? A canoe trip on the Chicago River’s North Branch! We’ll team up with naturalists and guides from Friends of the Chicago River for a two-part exploration of the Chicago River’s North Branch, which flows through forest preserves, city parks, and neighborhoods on the city’s NW Side. We’ll first assess the water quality and streamflow volume through performing a chemical, biological, and physical assessment of the river and its biota. Then, we’ll get a canoeing lesson and take a Chicago River-led canoe trip down a several-mile stretch of the North Branch — a very scenic yet ecologically instructive part of the river. $30 field trip fee is required, but well worth it (fee significantly reduced due to generous support by RU’s College of Professional Studies). Fri. 10/11 — Tour of Stickney WTP and Selected River Sites. This week we’ll marvel at the world’s largest wastewater treatment plant, in Stickney IL, on an official tour of the Metropolitan Water Reclamation District of Greater Chicago’s Stickney facility. After our tour, we’ll carpool to some nearby sites along the South Branch of the Chicago River / Sanitary & Ship Canal Corridor, such as the Chicago Portage National Historic Site, Canal Origins Park, and Bubbly Creek. Fri. 11/1 — Great Lakes Bioneers environmental conference at RU’s Chicago Campus. This Friday our class has the tremendous opportunity to attend a major environmental sustainability conference being hosted by RU in the Wabash and Auditorium Buildings on Nov. 1st through 3rd. Friday afternoon will feature an in-depth workshop on water issues, so plan to attend as much of the day’s activities on Friday as your schedule allows. Speakers at the conference include key writers, activists, and educators David Orr and Sandra Steingraber, among many others! Details about the conference will be posted early in the semester. A registration fee is required, but will be at a special reduced rate (TBD) due to the generous support of the College of Professional Studies at RU. 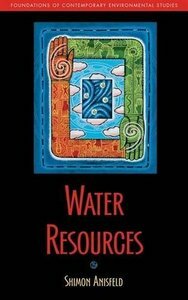 Shimon C. Anisfeld, Water Resources (Island Press, 2010, paper, ISBN 1597264954). On order and available at the RU Bookstore (Wabash Building). See the book’s website at Island Press for more details. Key concepts and themes to be addressed in SUST 220 include the science and policy of ensuring a safe water supply; water conservation strategies, particularly in urban areas; wastewater treatment and watershed management; threats to water supplies posed by pollution and development; and wetlands ecology and restoration. Students will develop a thorough understanding of the water cycle and its relation to the sustainability of water systems; understand and assess the importance of water as an environmental as well as cultural resource; learn to define, measure, and sample water quality in a variety of contexts using field-based water sampling techniques; and evaluate contemporary water management and policy issues, particularly those affecting the waterways of the Chicago region as well as the Great Lakes ecosystem. Email Prof. Mike Bryson at mbryson[at]roosevelt.edu or call him at 312.281.3184 (Chicago office). This entry was posted in courses, faculty, field trips, Roosevelt, students, water. Bookmark the permalink.